NASA found heavy rainfall occurring in Tropical Storm Miriam as it continued moving through the Eastern Pacific Ocean. As the Global Precipitation Measurement mission or GPM core satellite passed over Tropical Storm Miriam on Aug. 28 at 9:39 a.m. EDT (1339 UTC) it continued to strengthen. GPM found heavy rainfall occurring in a band of thunderstorms wrapping into the low-level center from the western quadrant where rain was falling at a rate of over 10 inches (263.3 mm/hour). GPM is a joint mission between NASA and the Japan Aerospace Exploration Agency, JAXA. Fortunately, Miriam is far from land, so there are no coastal watches or warnings in effect. 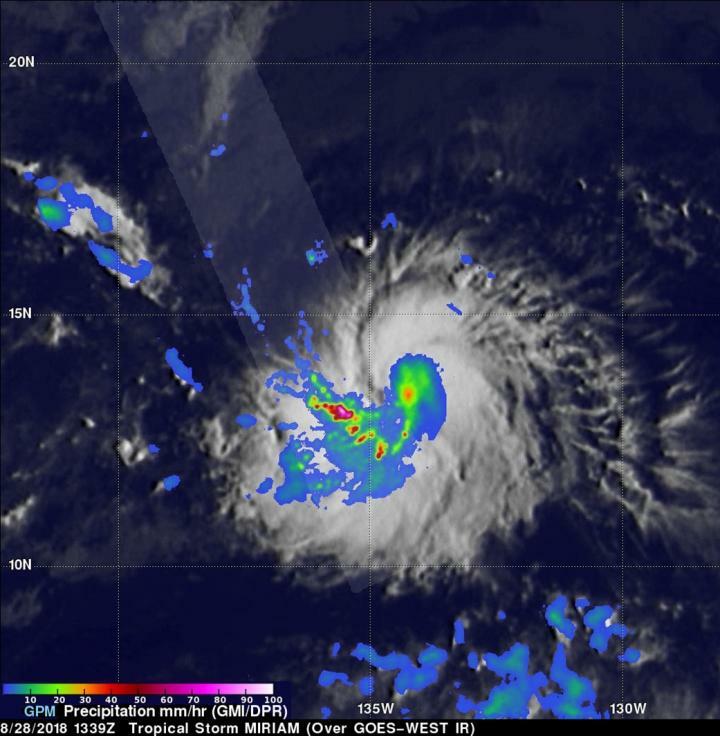 At 5 a.m. EDT (0900 UTC) on Aug. 29, the center of Tropical Storm Miriam was located near latitude 14.2 degrees north and longitude 138.4 degrees west. That's about 1,165 miles (1,875 km) east-southeast of Hilo, Hawaii. Miriam was moving toward the west near 13 mph (20 kph). A turn toward the west-northwest with a decrease in forward speed is expected by tonight, followed by a turn toward the northwest and north through Friday night. Maximum sustained winds are near 65 mph (100 kph) with higher gusts. Tropical-storm-force winds extend outward up to 80 miles (130 km) from the center. The estimated minimum central pressure is 999 millibars. Some strengthening is possible during the next day or two, but Miriam is expected to begin weakening by Friday.